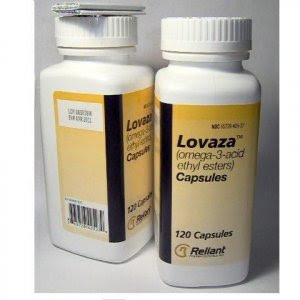 Lovaza is a brand name version of the generic medication omega-3 acid ethyl esters used to treat high triglyceride levels and is available via prescription only. This drug is a lipid-regulating agent; though it is not well understood how this drug works there is some belief that it may work by decreasing the production of triglycerides in the liver. Certain medical conditions may require special tests or dosage adjustments to ensure you can safely take this medication. It is important to take this medication exactly as prescribed to avoid minimizing the potential benefits. There are two different ways to take the typical daily dosage of Lovaza, which is 4 capsules; you can take 4 capsules all at once or you may take 2 capsules twice per day. It is important to follow your doctor’s directions when taking this medication. Lovaza capsules should only be taken whole and should not be crushed, broken, or opened; if you are unable to swallow pills, talk to your doctor as you may not be able to take this medication. You should have frequent blood tests performed to check you triglyceride and cholesterol levels while taking Lovaza, this ensures that the medication is helping treat your condition and is not causing adverse side effects. If your symptoms are not improving or if they become worse, notify your doctor right away as you may need a dosage adjustment or a different medication. 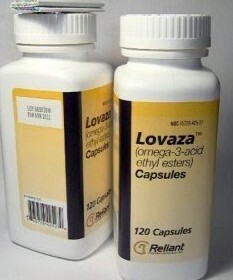 Lovaza is used to treat patients with high triglyceride levels. It is important to use this medication in conjunction with a low fat, low cholesterol diet; by losing weight, lowering alcohol consumption, and treating any underlying diseases you have you can maximize the potential benefits of Lovaza. Lovaza should be taken at the same time each day to receive the maximum benefits from it; it can be taken with or without food however, if stomach upset occurs, take it with food. This medication has not been shown to prevent strokes or heart attacks. Lovaza should be used in conjunction with a healthy living plan in order to maximize its potential. There are numerous ways to lower the triglyceride levels in your blood by adopting an overall healthy lifestyle; you should talk to your doctor before taking this medication to make a plan for a healthy diet, exercise, and weight loss. It is also important to lower your alcohol consumption, treat any underlying diseases such as hypothyroidism or diabetes, and adjust the doses of medications that could be raising your triglyceride levels such as estrogens and blood pressure medications. Pravachol is the brand name of the generic drug Pravastatin and is in a group of drugs known as HMG CoA reductase inhibitors or ‘statins’. Crestor is brand name for the generic prescription drug Rosuvastatin in the group known as statins. Statins are used to treat individuals with high cholesterol. Welchol is a brand name version of the generic medication colesevelam and is used for reducing high cholesterol levels; it may also be used to treat type 2 diabetes.